Hauser & Wirth Los Angeles is honored to present ‘Takesada Matsutani,’ the first Los Angeles solo exhibition for the Osaka-born, Paris-based artist Takesada Matsutani. Opening 1 July 2017 and coinciding with the debut of his commissioned works at the 2017 Venice Biennale, ‘Takesada Matsutani’ is an illuminating survey that spans the artist’s career, which began with his participation in the Gutai Art Association and evolved to express the complexities of a life lived between Japan and France. The exhibition features 23 works from three distinct periods: 1960s Gutai-era pieces never before shown outside of Japan, one of the artist’s largest installations from 1983, and a new pre-figuration of his 2017 Venice Biennale project amongst the geometric and colorful works from the 1970s. Organized with Olivier Renaud-Clément, this exhibition offers an expansive look at Matsutani’s unique visual language of form and materials. His paintings, drawings, and sculptures engage themes of the eternal and echo the endless cycles of life and death, revealing the influence of the ethos of Gutai on the artist’s early experimentation and its lasting impact today. The exhibition will also include a site-specific floor work, continuing a long-standing performative aspect of artist’s practice. Matsutani will create this piece in the South gallery of Hauser & Wirth Los Angeles. From the early 1960s to the early 1970s, Matsutani was a key member of the ‘second generation’ of the Gutai Art Association (1954 – 1972), Japan’s innovative and influential art collective of the post-war era. 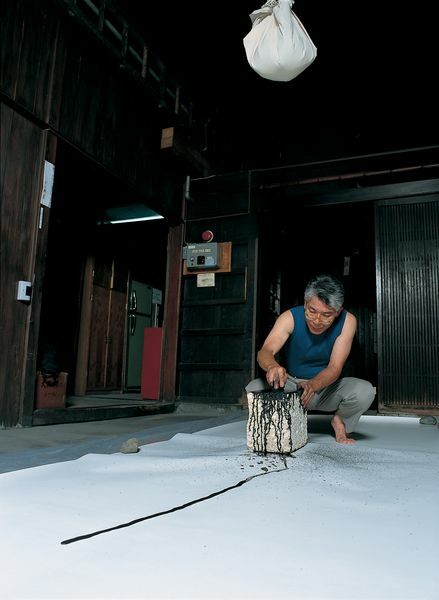 One of the most important Japanese artists still working today, Matsutani continues to demonstrate the spirit of Gutai throughout his practice, conveying the reciprocity between pure gesture and raw material. Exemplary of his commitment to the Gutai ethos is Matsutani’s lifelong artistic exploration with polyvinyl acetate adhesive, otherwise known as Elmer’s glue. Harnessing the rapid economic and technological growth of post- WWII Japan, a young Matsutani chose to explore the expressive opportunities of vinyl glue, a material that first entered mass production in the early 1960s. In his earliest experiments, Matsutani impregnated the canvas surface with bulbous elements, using his own breath to create swollen and ruptured forms evocative of flesh and wounds. 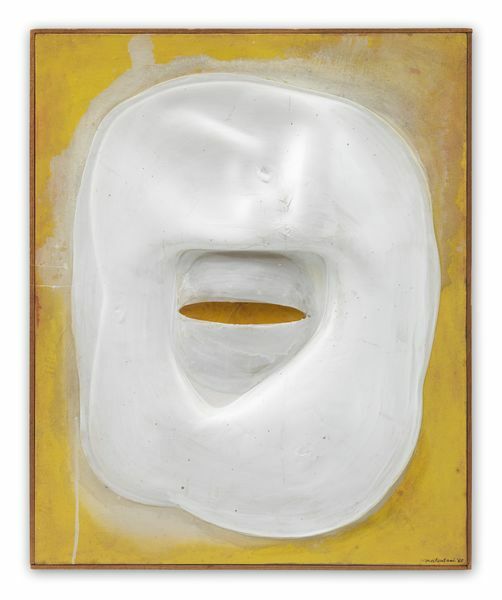 ‘Work 62’ (1962), one of the first examples of Matsutani’s use of vinyl glue, exemplifies the artist’s innovative approach of pouring glue on the canvas surface, turning it upside down, and allowing it to dry in the wind. He recalls, ‘The glue began to drip and as it dried, stalactites formed, which looked like the udders of a cow.’ Inspired by observing bacteria through a microscope at a friend’s laboratory, Matsutani developed this technique further, using hairdryers, fans, and his own breath to create bulbous forms reminiscent of the curves of the human body. The result of his experimentation – letting material and spirit work in conjunction with one another to create something new – captured the attention of the Gutai leader Jiro Yoshihara, who formally invited Matsutani into the Gutai group in 1963. Although the group rejected figuration, they embraced Matsutani’s sensuous forms, as seen in ‘Work 63-K’ (1963) and ‘La Propagation B (Grise)’ (1963) – painterly surfaces suffused with sliced orbs evoking open mouths, blisters, and sexual organs. This exhibition features a range of these early experimental works. Soon after moving to Paris and beginning work at renowned engraver Stanley William Hayter’s Atelier 17, Matsutani devoted himself to the techniques of etching, printmaking, and silkscreen. Hayter’s workshop, both in Paris and New York, was a center for creative exchange and production, engaging the artistic minds of Louise Bourgeois, Salvador Dalí, Marcel Duchamp, Max Ernst and Joan Miró. Through Atelier 17, American Abstraction and the New York School collided and mingled with the European avant-garde; for Matsutani, Atelier 17 introduced new forms of artistic experimentation. Influenced by the theories and history of ‘the image’ in Western culture, and especially by American Minimalism and the Hard Edge paintings by artists such as Ellsworth Kelly, Matsutani began to conceive new compositions, re-arranging and testing the limits of pictorial space. From 1970 – 1972, Masutani transformed the same organic and biomorphic forms he first developed in glue into flat geometric planes of color on canvas. This exhibition features a number of paintings from this singular period in the artist’s career. Beginning around 1977, a few years after the Gutai group dissolved in 1972, Matsutani sought to distill his practice. ‘If you only have one paper, one pencil, what can you do with it?’ the artist asked himself. Exclusively working with black graphite in an expressive manner, Matsutani covered the white ground of a textured canvas or monumental sheet of paper with repetitive, successive strokes. Through the building of layers, each mark and charcoal smudge captures the accumulation of energy and tension in a powerful manifestation of material and time. 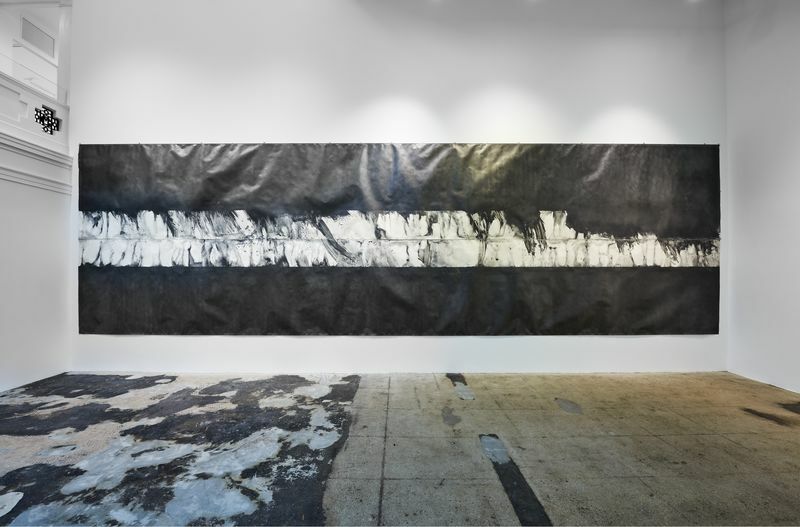 ‘Nagare-8’ (1983) is one of Matsutani’s largest works from his Stream series (1977 – present), a ten-by three and a half meter canvas roll, which the artist has covered in a blanket of graphite, leaving just one white line coursing through its middle. The surface possesses a grated, abrasive texture obtained by first scratching the entirety of the blank sheet’s surface with a nail. To complete this drawing Matsutani splashed turpentine over the edges of the densely saturated surface. Through a technique that dissolves his graphite in a tremendous surge, Matsutani’s Stream series exudes a forceful sense of existence, transformation, and becoming. These majestic works are complemented by a presentation of intimately scaled drawings from the mid-1970s. In these drawings, Matsutani employed graphite, household paint and turpentine on paper to create vivid gestural works reminiscent of his artistic beginnings with the Gutai group in Japan. Matsutani’s later paintings bring together the artist’s signature media, vinyl glue, with graphite. In a marked difference from the raw rendering of his early works, Matsutani carefully controls the glue as it moves across his canvases, making or deflating pockets of air and creating new ridges, wrinkles and crevices as the adhesive hardens. He then covers the surface in methodical, almost meditative, graphite lines, as seen in ‘Oval’ (1992). Being shown to the public for the first time, a select group of nine jewel-like paintings made from 2014 – 2016 showcase Matsutani’s mastery of form and gesture; flourishes borne from a life dedicated to the practice of artistic expression through experimentation of material. The shapes created resemble the unbridled energy of a crashing wave or the inside of a seed preparing to germinate, whilst the graphite reflects light, teasing out hints of texture, depth and volume. Complementing his 2017 Venice Biennale presentation, this exhibition includes ‘Venice Stream’ (2016), a precursor and small-scale iteration of the tondo element that will be exhibited Summer 2017 at The Venetian Arsenal.